If this is a cross-listed course, see this article for additional details about adding students. If you've enabled online registration, students will automatically be added to the Roster when they self-register. You can also add students and auditors to the course yourself. Select Add students by name. Start typing a student's name in the Search/Add field and select from the results. When you select a student, you may see warnings about the student's enrollment (Prerequisites not met, et. al.). Click to delete a student; only use this option to correct a mistake! Select Enrolled or Auditor for a status and modify the date, if necessary. If it is before the course add/drop date and the Max. Enrolled limit (if any) has been reached, you will also have the option of adding the student to the waiting list. Repeat the above until you have all the desired students listed. When you save, the students will be listed under the default course name. Select Import students from another course. Select the term and then the course from which you wish to import students. Check if you wish to ignore enrollment requirements. Check off the students you wish to import. If it is before the course add/drop date and the Max. Enrolled limit (if any) has been reached, you will also have the option of adding students to the waiting list. Click to delete a student. Only use this option to correct a mistake! If you elect to ignore enrollment requirements, all of the students you selected will be listed under the default course name. The email will contain information regarding which requirements were ignored in order to add those students. Students who pass all requirements will be added under the default course name. Students on leave of absence or who have not completed prerequisite courses or equivalents will not be added. Students enrolled above the max. enrolled (if any) will be put on the waiting list. Status shows the students' enrollment status. See below for instructions on how to change a student's status. Retake indicates whether this course is counted as a retake on the student's transcript. You can change this after the student is finalized. Auditing, Withdrawn, and Waiting List students are typically managed by the Academic Admin/Registrar. However, if the course's Enrollment setting permits faculty to manage enrollment, then the course faculty will be able handle all enrollment changes up until the course's add-drop date. 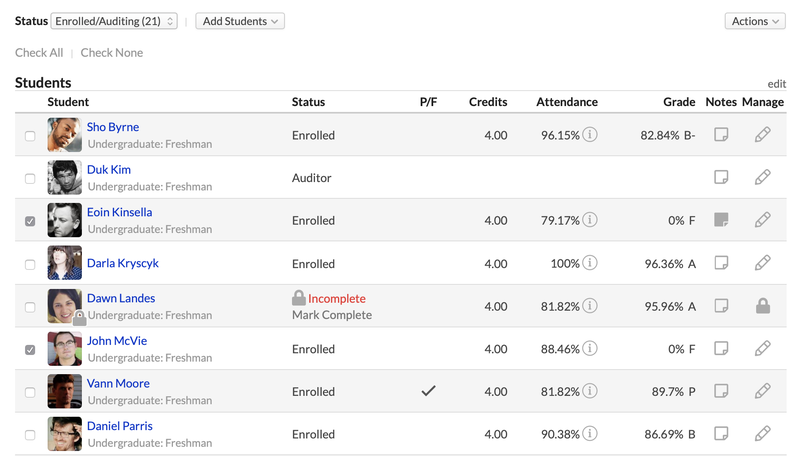 Use the Status selector to instantly filter the roster to show students of a particular status (e.g. Withdrawn...). In the Manage column, click next to the student's name. If you see , the student is finalized and you cannot change his status. Note the add/drop date when setting a student to Withdrawn. If the student is withdrawn before the add/drop date, he will simply be removed from the course. If he is withdrawn after the add/drop date, he will show a W on his transcript. Setting a status to Deleted will remove the student from the course and also delete all of his assignments, grades, discussion contributions, etc. To move students off the Waiting List and into the course, scroll down to the waiting list and follow the above steps. Use the Actions button to email your students or export them to spreadsheet or PDF. If any of the students have a verified phone number, you'll also have the option to SMS/text those students. Email this section or—for courses with multiple sections—Email all sections. Export this section or—for courses with multiple sections—Export all sections; this creates a spreadsheet of the students you're exporting. If an Incomplete student completes the coursework after she has been finalized, you can enter grades and submit a Final Grade without unfinalizing the course. Complete instructions are found in this article. Automatic; this option preserves your existing Retake policy for that student. Yes/No; these options manually set whether this course instance should count as a Retake for that particular student, thus over-riding what would normally happen according to your existing Retake policy.